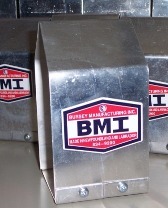 A 2-piece aluminum guard that is mounted around the tank gauge located on the top of an oil tank. The 2-piece design allows the guard to be installed easily on tanks already in use since it is installed without having to remove the gauge from the tank. The purpose of the gauge guard is to shield the gauge and prevent it from damage and / or breaking.